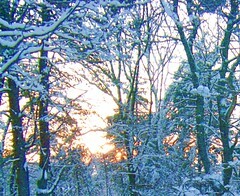 Tonight I cropped this image from a photo that I took during a winter walk at Long Hill Gardens, back on January 19th. I was taking pictures of the flowering trees that line the road to the gardens. 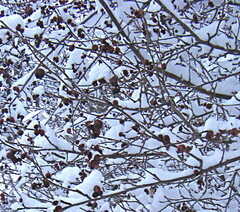 On some of the trees, you could see red berries beneath the fresh snow. I doubt that this is a cherry tree. The reason for the title is that as I took the photo, I was thinking that this reminded me of cherry vanilla ice-cream (one of my favorite flavors). Tonight, in addition to cropping the photo, I also adjusted the contrast and saturation to make sure the berries would be visible. This is another of the paintings that I finally got around to photographing, earlier in the week. 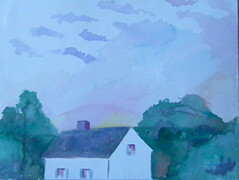 This is a watercolor that I painted perhaps six or seven years ago. I met some friends at Lynch Park (a wonderful oceanside park here in Beverly, MA) and we went into the Rose Garden to paint. We were all members of a drawing group at that time. I remember being frustrated at having to leave before I could finish this painting. Tonight I cropped the photo. In cropping it, I eliminated some of the areas that I felt were unfinished or unresolved, and now I like it better. But what I like best about it is that it makes me feel like painting! This is a painting done with acrylics on paper, and unfortunately, I didn't notice that the piece of paper that I chose to paint this on already had a painting on the other side! (See yesterday's post!) There are lots of mistakes a person can make in an art class, but at the time, this seemed to be the worst kind of artistic mishap! It was funny, but also frustrating! I liked both paintings, and couldn't frame one without losing the other. But now, thanks to digital imaging, I can "keep" both paintings. And I am glad because even though this painting is a little rough around the edges, it is definitely a keeper. (It could use a little work because I quit working on it, once I realized my mistake.) 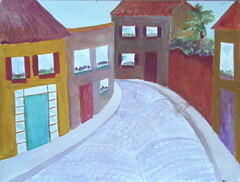 It is a street scene of the Foz in Porto. I painted it from imagination and memory, drawing from my visits to Portugal. Yellow ochre is an unusual color choice for me, but that's a color that you see on many of the houses on the wonderful, winding streets of Porto. 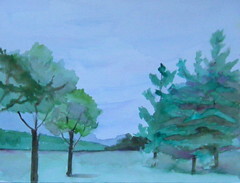 Recently, I have been photographing and posting some paintings that I did several years ago. Like the painting I posted yesterday, this is also a watercolor landscape done as part of a class. I was trying to paint the sunset, so I had to work quickly. I was trying to capture the look of the summer sunset over some of the small wooden houses at the center of town. Although I can always find things wrong with any of my paintings, including this one, I was surprised and happy with the look of the sky. Well, I am especially happy to have a digital image of this painting, because a few months after I painted it, I accidentally created a painting on the other side! I was painting with acrylics on paper, and didn't realize what I had done until I was finished. And to make the situation more complicated, I also liked the second painting! Two paintings on one piece of paper! Don't laugh! I was upset because, well, what can you do with either image? But now, thanks to digital imaging, I can use both images. Tomorrow I will post the image that I painted on the back of this painting. This is another of the paintings that I mislaid and then found, and have been meaning to photograph. I finally got around to this one two days ago. 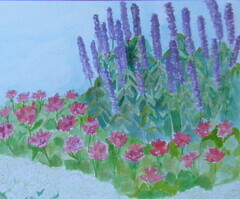 This painting was a exercise in a watercolor class I took several years ago. We were all painting outside, in the park (Beverly Commons). The composition is simple, and a bit eccentric, but I do like the texture of the trees. I have had a bad cold all week. I have been coughing my head off while watching CNN, but not doing much beyond that. But yesterday I knew I was getting better when I found myself going through a folder of watercolor paintings in my room, where I had stashed them until I had a chance to photograph them. A few months ago, I came across some paintings and drawings that I did several years ago, and had apparently mislaid. Once I found them again, I started photographing them to add to my computer files, and posting them here, while I was at it. Well, I had gotten a good start on that project, but then things came up, life got hectic, and so it goes. But yesterday I had nothing more pressing to do than cough and hack. So I photographed several of the watercolors (including the one I posted here yesterday), and suddenly I felt much better. 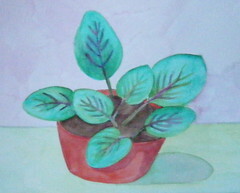 Here is one of the paintings, a very simple and stylized watercolor of a house plant. From the look of the leaves, it may be a prayer plant. I don't remember anything more specific about this painting other than that among the first paintings I did with my travel watercolor set. Tonight I did just a little cropping to focus more attention on the plant. I came across this little painting today, and decided to photograph it to add to my computer files. I painted this little watercolor sketch a few years ago, during one of my visits to Porto, Portugal. Most of my other watercolors of Portugal were done from photographs after I got back home. But in this case, I was working only from visual memories that were quite vivid (and recent at the time). During my visits to Porto, the daily routine usually includes several opportunities to drive along the Douro River. I always love to see the houses with along the winding river banks, and the beautiful bridges. But the views at sunset are especially wonderful. During my stay, I took advantage of a quiet half hour indoors to create this little watercolor sketch, using my travel watercolor set. I had no photographs to use as reference because they were still in my disposable camera! But I thought I might be able to recreate the scene from memory. I wasn't sure of the details of the bridge, but then, there are a number of wonderful bridges in Porto. What I remembered most clearly was the magical scene of the colorful clouds seen through the bridge at sunset. 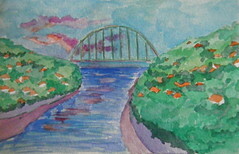 Well, this watercolor sketch is very small, only 8 x 5 inches, but it holds many great memories per square inch! 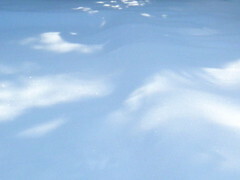 I love the way snow looks on a sunny day. 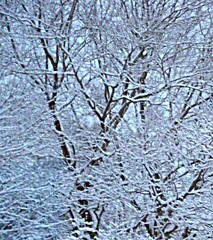 Tonight I cropped this image from a photograph that I took when the sun came out after our recent snow storm. 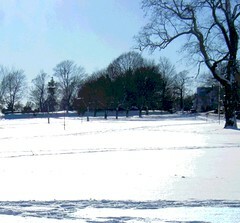 I also adjusted the contrast and saturation just a bit, to try to capture the way the snow really looked that day! The snow flakes actually looked like glitter, and if you look closely, you can see that in this image. This is a another photo from a walk at Long Hill Gardens last Monday. What I was most interested in was the contrasting textures made by the trees, branches, and brambles, as well as the backlighting of the sky. What I like best about snow is that it makes you see things you might otherwise overlook. Tonight I cropped the image just a bit to get this composition. Over the weekend, I had planned to get to the studio, but didn't go because of an unexpected snowstorm. Instead, I decided to stay home and continue organizing my beads and other materials for making jewelry. I didn't get very far with that either, because almost immediately I came across another necklace that I had started, so I decided to try to complete it. At that point, the necklace only included the faux pearls and the gold caps at the ends. I added the pink crystals and the little gold-colored roses. (This wasn't easy. 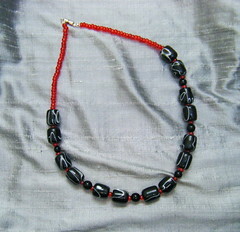 I miscounted one or twice, and at one point, the wire came out and the beads came apart, so I had to do overs.) When I was finally done, I liked the design. But even with the beads I had added, the necklace is still just a bit too short, so I plan to add tiny gold beads to each end. I will have to get to a craft store to buy some, because I am all out, and I hope to have a chance to do that soon. In the meantime, I am posting this here as a work in progress. This is costume jewelry, just for fun. But even though the pearls aren't real, as an exercise in design, this is the genuine article. Today I got up early, excited to see the beginning of a new day. 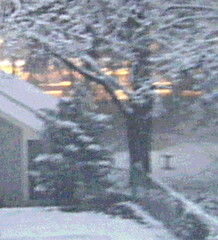 The rising sun looked beautiful through the snow-covered trees, so I took some pictures. This was one of the best, so I used Painter to posterize it and then cropped it to get this composition. I took this photo today during a walk at Long Hill Gardens, here in Beverly. (The original plan was to try to find the Alt Woodlands, listed under the "Take a Hike for Conservation" category for the National Day of Service today. But the Alt Woodlands could not be found; perhaps the signs were covered with snow.) So instead we went to Long Hill Gardens, which was nearby, and part of the Trustees of the Reservation. Although at first I was not eager to tromp through the snow, I was very happy once I saw how beautiful Long Hill Gardens looked today. The trees looked ready for a big January celebration! I took lots of pictures, and this is one of the best, the long row of trees along the road leading up to the garden. I thought we were due for a light dusting of snow, but it was already snowing when I woke up and it kept snowing all day. It's a nuisance, but it made the trees look quite beautiful! 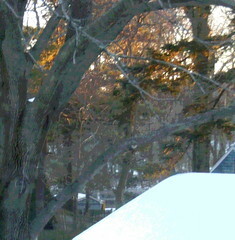 Late this afternoon, I took a picture from the back door, then cropped the image to get this composition. But the image needed a bit of help, so I opened it in Painter, sharpened the focus, and then posterized it. I had hoped to go to the studio this morning, but the temperature was still at zero degrees, so I decided to stay home and make some jewelry instead. It's been a while, so I decided to just start by trying to organize my beads. One of the first things I found was this necklace, all put together, but not finished. 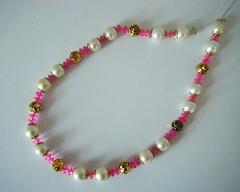 I had forgotten all about it, though when I saw it, I remembered designing it and stringing the beads. So today I finished off the ends (always the hardest part for me!) and put on the clasp. Then I photographed it, and here it is. This image began during a recent walk to Dane Street Beach here in Beverly, MA, after a recent snowstorm. I loved the bright sun on the snow and the tracks made by people (and dogs) heading across the park to get to the beach. Today I edited the image and posterized it using Painter. This image began as a photo that I took two summers ago, from the penthouse of my aunt's apartment building on Manhattan's upper west side. (Tonight I cropped this composition out of the original photograph, then used Painter to posterize some selected areas.) I became acquainted with the Hudson River at the age of seven, during a train trip from Colorado to visit relatives in New York. 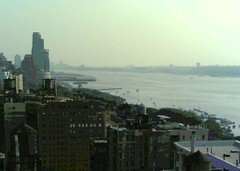 As we neared New York City, my father explained that the train would be going under the Hudson River. (WHAT?) Years later, this amazing passage became (almost) common place when I lived in New Jersey, and frequently made this underwater crossing by train or in the Lincoln or Holland Tunnel. Today the Hudson River became a marvel yet again, as it became a makeshift runway, providing safe passage in a most unexpected way. I used my Painter program to create this digital woodcut from the photo that I posted here yesterday, an image of the Cummings Center Pond, covered with snow on an overcast day. I adjusted the settings to make sure that the woodcut effect was emphasizing the lines and textures against the stark white of the snow and the heavy gray of the sky. It was still cold today, around 20 degrees, with snow on the ground, but blue sky and bright sun -- a great day for a walk with the dog on the beach! It might sound like a crazy idea, but there were lots of other people on the beach walking their dogs, and everyone was having a great time! I liked the view of the snow at the beach, so I took several pictures, and this composition was one of the best. 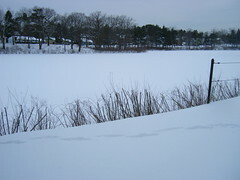 However, in the original version, a dog-owner and dog can be seen walking along the shore. I didn't notice them when I took the picture. But even though the two figures actually added to the composition, I thought the person might be recognizable and I didn't have permission. So I opened the image in Painter and used cut and paste and a little digital airbrush to quietly hide the two figures, leaving a very quiet beach. As predicted, we had a snowstorm overnight, and it stopped snowing by midmorning. I love the way fresh snow looks, so I took a few pictures before I started shoveling. 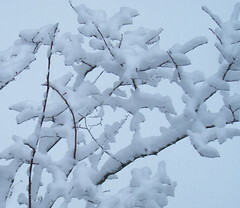 The snow contrasted with delicate lines of the blueberry bush reminded me of a pen and ink drawing. Tonight I cropped the photograph to get this composition. Yesterday I got up early to get started on two big projects that I needed to finish by the end of the day. But the morning light was wonderful as it fell on the trees, so I couldn't resist taking a few photos before I started working. Tonight I edited and posterized them. I think I like this version the best because it captures the light, and the contrast of the complicated tangle of branches against the snow on the rooftop. 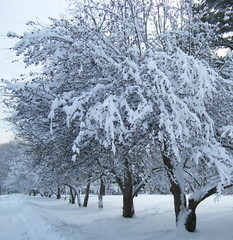 Well, it is even colder today, and another big snow storm is predicted for tomorrow. So I think it is time for one more look back at summer. This is another digital woodcut that I made tonight with my Painter program. I used another photograph that I took last summer during a walk at the Cummings Center. The roses are just a bit past their prime, but I think that works with the theme of memory, nostalgia, and the passage of time. I used a little color overlay on this one. I did have trouble deciding where to crop. A closer crop would probably be a more traditional way to frame the roses, but I didn't want to lose the complications of the leaves. Here is another digital woodcut that I made tonight with my Painter program. Like the image I posted here yesterday, this also began as a photograph that I took last summer during a walk at the Cummings Center Pond. I like the way the woodcut effect emphasizes the complicated lines of the flowers and leaves. Last night it snowed several inches, and by morning we were having freezing rain and then rain over snow. This morning's shoveling of very heavy water-logged snow took place in the rain, and it has been dark and gloomy all day. 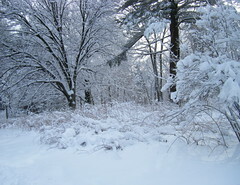 Winter weather can be beautiful, but not the dismal gray slush that we had today. So instead of posting a winter image, I am posting a summer memory! 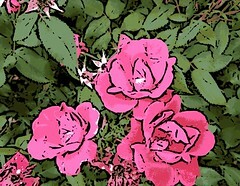 This image began with a photo of roses that I took in July during a walk at the Cummings Center Pond. Tonight I used my Painter program to transform the photo into a digital woodcut, maximizing the bright colors as much as possible. Then I cropped the image to get this composition. 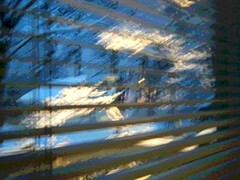 Here is another posterized photograph, another evening snow scene, this one from early December. It is similar in subject matter to the image I posted two days ago (Bright Light on Winter Night), but this photo taken earlier in the evening, as it was just beginning to get dark. What interests me about both of them is the effect of the street lights as background to the snow scene. I cropped the image to get this composition and also posterized the image in Painter. Tonight I used my Painter program to create this digital woodcut from a photograph that I took a few weeks ago. It was December 19th, and there was heavy snow in the forecast. 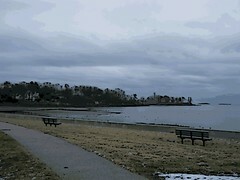 The storm was supposed to begin around noon, but there was time to get a walk in before it started. 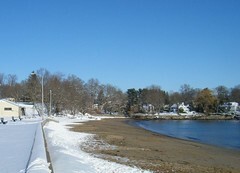 The destination was Dane Street Beach, here in Beverly, not too far from home in case the snow got started early. You could see from the sky that the storm was coming, and although I was freezing, I took my hands out of my pockets long enough to get just the one photograph. I am glad I did, because I liked the result, and thought it would look good as a digital woodcut. This image is a digitally modified version of a photo that I took on the night of December 19th, during a stretch of snowy weather. The original photo was almost completely black with just a patch of yellow showing. So I used the iPhoto program to do some basic editing, adjusting the brightness and contrast just to see what I had. Once I could actually see the image in the photo, I thought it had potential. 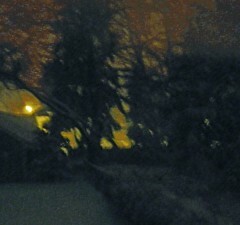 It captured the snow and trees back-lit by the street lamp. But I didn't like the color of the electric light, which was an acid yellow in the photo, not the soft apricot that I had actually seen. So I opened the image in Painter and used the magic wand tool and some color overlays to soften the color of the sky. I also added some soft purple color overlays to the trees. Then I cropped the image to get this composition, and here it is. 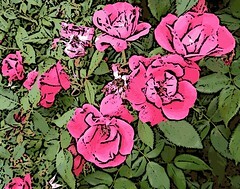 This image began with the photos of roses that I took at BJ's Wholesale during a New Year's Day grocery store run. 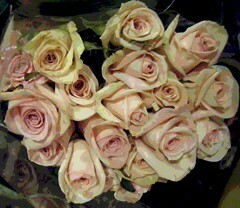 There were lots of bouquets on display, all roses, and each bouquet a different color. The original photo did not have a sharp focus, so tonight I decided to try posterizing it, using my Painter program. I also did a little cut and paste and used some digital pastel to hide a store label that was distracting. Then I cropped the image to get this composition. 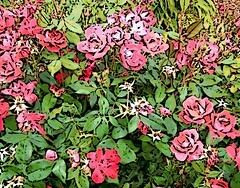 This is a posterized version of the image that I posted here yesterday, a photo that I took of some roses that I saw on display at BJ's Wholesale Store. This was during a grocery run on New Year's Day and I was feeling less than festive as I slogged through the store in my wet boots! But the roses were lovely and photographing them made me happy! (That's what art does for me!) I was even happier when I had the result, the edited photo that I posted here last night. But I think this posterized version is even better. It makes the roses look like satin! It doesn't matter where you find beauty. You can even find it at BJ's Wholesale. The important thing is to look. The excitement of New Year's Eve seemed long gone this morning. And today didn't seem like much of a holiday as I spent it digging out my car, running errands, and catching up with work. The highlight of the day was shaping up to be a hot chocolate on the way to do a grocery run at BJ's Wholesale. As I slogged through BJ's in my parka, felt hat, scarf, and wet boots, I felt very far from the Pasadena Rose Parade. 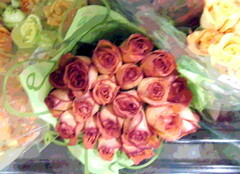 But on the way to the check out stand, I passed a display of roses, so I stopped to take pictures with my digital camera. Tonight I edited them, and this is one of the best photos. I like the way the roses are reflected in the cellophane wrapper. I am happy with this photo just as it is, but tonight I also posterized this photo in Painter, and am very excited with the way it turned out. I will publish the posterized version here tomorrow. I guess it pays to stop and smell the roses, no matter when and where you find them.